I’ve had several cats live into their early 20s. I hope Chessie just needs some medication. My thoughts are with you. Thank you ~ we discussed meds today but I just can’t put her through chemo at this stage. She’s lost 3 lbs in the last 3 months and I don’t think her body could take it. She’s not in pain which is great ~ so we’ll just keep her comfy and loved. I have a lot of pet dogs when I was young but they all died one by one bec of old age and it really depresses me so I didn’t want anymore pets. Hope Chessie will be well soon! Love your kitties! Don’t get me started on my babies…all gone (old age, medical issues) but we are getting ready to adopt. 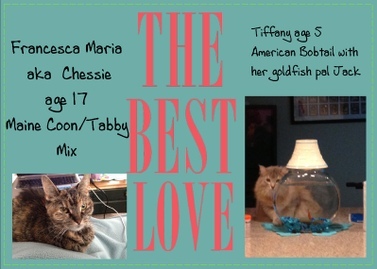 Our Chessie was a rescue as well ~ there’s never a better guardian angel kitty in the world. She’s sitting here next to me now, curled up sleeping while her sister bounces around like Tigger. So how do you mend a broken heart? Mine is coming soon. This is beautiful. I understand completely. I pray that all goes well today. Thank you so much for your sweet words and understanding. Sadly, it did not go well today, but she is home, next to me sleeping soundly. My heart is heavy today but I am grateful she is not in pain. I am sobbing for you knowing how hard this time is for you. Chessie’s energy will never lead your side now – you can be so sure of that. You gave her the ultimate in “perfect cat life” ever! You were and will continue to be both so blessed by God’s gift to each other. Thanks for sharing Patty ~ so sorry over Smokey ~ we understand each other…hugs to you. xo Chessie will always live in my heart. We were discussing at bible study tonight how when we lose someone we love that we should find comfort in the blessings they were to us. I found I was rich in blessings with all of my “deposits in heaven” (using one of Barbara Johnson’s quotes). I know the blessing Chessie is to you will bring you comfort in the days ahead. My daughter and I cried when I saw your post – we send you our love and hugs. How is it going? How’s Chessie doing? I’m thinking about her and you. OH! How special you were all together. That’s the way we do it, too, when it has to be done. Loving until the end. Poor you.